As I review my wildflower photos from this past summer, I see the bright yellow petals of the sunflowers and the purple strands that make up the thistle flowers. 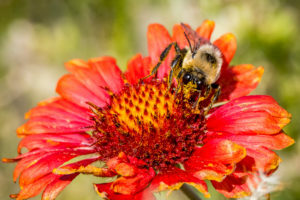 My eyes are drenched in color when I spot the red and yellow blooms of the spectacular Indian blanket flower. I imagine how each flowering beauty must be calling out, “choose me, choose me.” Pick me, pollinating bees, butterflies, and moths. Hop onto my ample nectar laden centers dear grasshoppers, tree crickets, lacewings and katydids. Gleefully rub your tentacles and antennas and legs and tiny hairs and mouth parts with my glorious orange and yellow pollen grains. Take my message to other plants so we can thrive and survive. What, you’re done already? But I have far more to give! Don’t go yet. But, wait, here comes another one, a fuzzy bumblebee buzzing away to help me release my pollen. Oh, how gladly I want my pollen to attach itself to you, oh beautiful creature with your hairs of deep black, brown and rich yellow. Take all the pollen you can carry in your pollen baskets, and return for more, as I have so much to offer. Oh, here comes a butterfly, wait, several are heading my way. I’m ready to burst with all of this pollen and nectar now that the sun has warmed my petals. 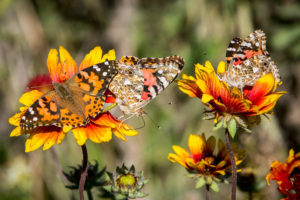 Look, the butterflies are fighting over who goes first! Colorful painted ladies, orange and black monarchs and yellow clouded sulphur butterflies swirl in the air around my position in this prairie meadow. Oh heavens, a gigantic black swallowtail butterfly just took a sip from my nectar. Another one to take my pollen far and wide! I’m happy now – the bees, the butterflies and all of those insects have drank thirstily. As summer fades, I’ll dream of all of the little flowers that will carry on as the next generation awaits the warmth of spring to begin to grow and bloom. Painted ladies on Indian blanket flower. 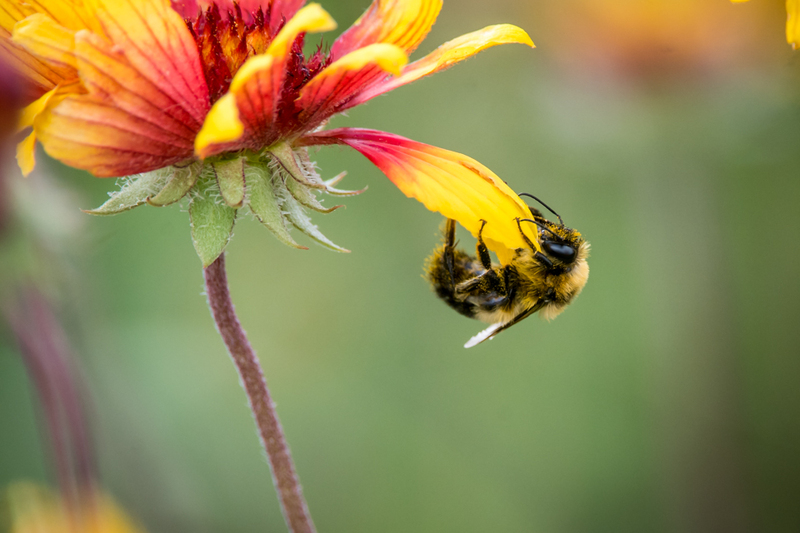 A sleepy bee hangs on by a petal, waiting for the sun to warm the air. 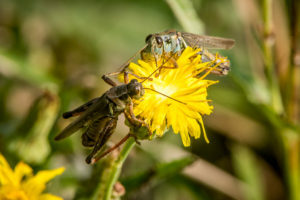 Grasshoppers eye each other over the tasty petals of a wildflower. 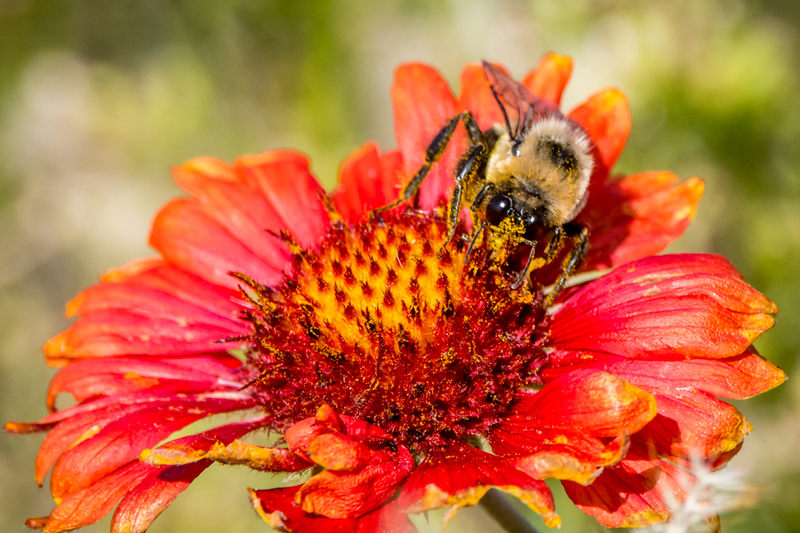 Bee on a tattered Indian blanket flower. 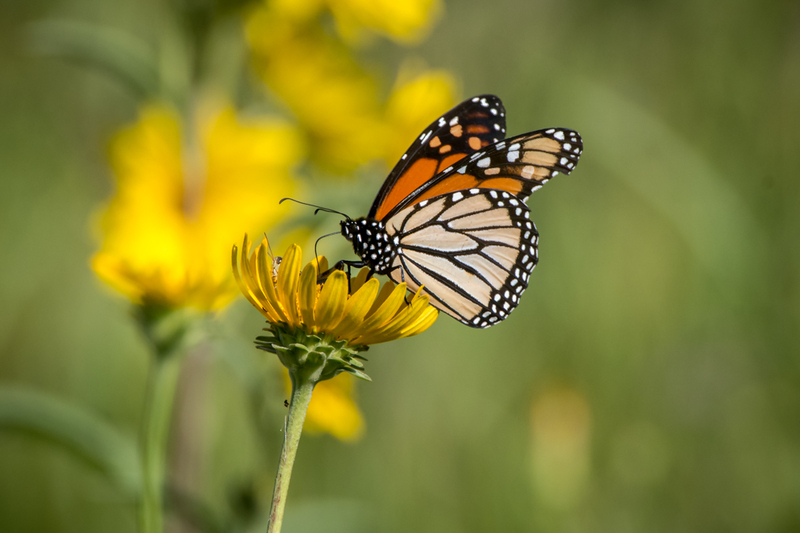 A monarch sips from a wildflower on the South Dakota prairie.